The energy price cap will make a “real difference” to the 12 million people stuck on the most expensive tariffs, a consumer group has said. Regulator Ofgem is set to be handed new statutory powers – dubbed a “nuclear deterrent” – to end inflated prices. The Domestic Gas and Electricity (Tariff Cap) Bill will put in place a requirement on Ofgem to cap standard variable and default energy tariffs until at least 2020 to tackle the amount consumers have been overpaying the Big Six energy suppliers, which the Competition and Markets Authority has put at £1.4 billion a year. The new legislation should be operating next winter after receiving parliamentary approval. Prime Minister Theresa May said: “For far too long, older people, hard-working families and those on low incomes have been subject to rip-off energy tariffs. Our energy price cap will protect households from unfair price rises in time for this winter when people can feel the pinch more acutely. 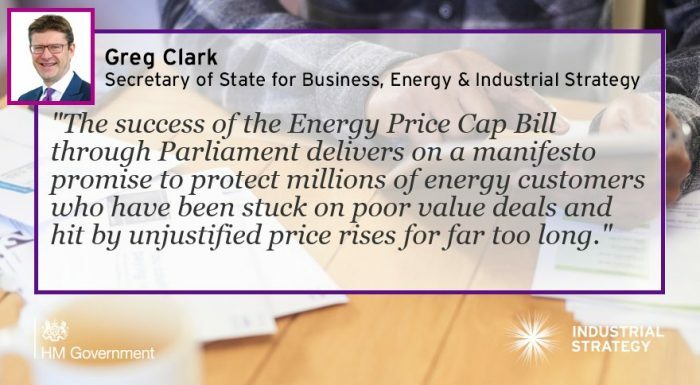 Energy Secretary Greg Clark said: “This Bill, which delivers on our manifesto promise, is a necessary intervention to protect millions of energy customers who have been stuck on poor value deals and hit by unjustified price rises for far too long. Citizens Advice chief executive Gillian Guy said: “The energy price cap will make a real difference to people’s lives. Capping prices for the 12 million people stuck on standard variable tariffs will stop firms overcharging customers who don’t or can’t switch supplier. However, comparison site MoneySuperMarket said its survey of 2,000 households last week found that just 21% of bill-payers believed the cap would save them money. Tory former minister John Penrose, who welcomed the Domestic Gas and Electricity (Tariff Cap) Bill’s departure from the Commons for Royal Assent, said he hoped the new powers would “never need be used”.